This and that about life in the Next America. There's a very nice write up of the civility campaign in Saturday's WSJ (subscription required), with a cameo from blogger Jesse Newburn at Hometown Columbia. We often wonder why you don't see well-told pieces like this in the local media. COLUMBIA, Md. -- Johns Hopkins University in Baltimore, 15 miles northeast of here, has a professor of civility. He is P.M. Forni, a 56-year-old Italian of elegant comportment and genteel speech who, a few years ago, set out to imbue America with "gracious goodness." Who in the Sam Hill does he think he is? That's what Heather Kirk-Davidoff thought when she noticed a proliferation of bumper stickers on cars around her neighborhood here in Columbia, a city of about 100,000. "Choose Civility in Howard County," the stickers said. Then came a rap on the door: It was the guest he had agreed to invite for an hour-long cordial exchange on the question of civility. Dr. Forni seated Ms. Kirk-Davidoff at his glass-topped table, offered her a fruit tart, which she declined, and cut the small talk. "I have a sense you have an objection to my work," he said. "You know, I live in Columbia," said Ms. Kirk-Davidoff. "It's a community built to foster civility." "A utopian enterprise," Dr. Forni said, going on to talk of longitudinal behavioral studies and the function of mirror neurons. "You don't like the fact that people should be told explicitly what is good and what is bad?" he asked. "It's the rules," said Ms. Kirk-Davidoff. "When we learn rules without learning compassion, the rules can do the opposite. Jesus didn't say, 'I am the rule,' right?" Dr. Forni was quiet for a moment. "Yes," he said. "Jesus said, 'I am the way.' If I had met you before, probably I would have used 'way.' The 25 ways of being considerate and kind." He managed a smile. The pastor smiled back and stuck out her hand. The professor of civility shook it. Owen Brown: Tell Your Neighbors! 9. Respect even a subtle "no"
Do Elections Make A Village? Columbia Talk invites comments. The reason we moderate submissions is to curb spam, filter out personal attacks on others, and avoid profanity. This blog is compiled by Dan Beyers, the business, health, science and environment topics editor of The Washington Post. The material here is something he prepares in his free time and it is not part of his work for the newspaper. Dan is a longtime Columbia resident. He moved to Wilde Lake in 1969, is a product of Howard County schools, and now resides in Oakland Mills. 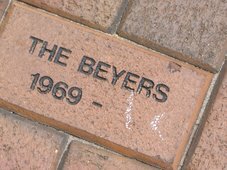 His family even has a brick near the entrance to Clyde's. Say hi at columbiatalk@gmail.com. For a peek behind the curtain, drop by behindcolumbiatalk.blogspot.com. That's where we talk about blogging, other projects we're involved in, and anything else that strikes out fancy. Columbia Talk uses Google Analytics, which relies on cookies to collect anonymous traffic data. We do not (and will not allow any third party to) track or collect personally identifiable information of Internet users, nor will we (or will we allow any third party to) associate any data gathered from our website(s) (or such third parties' website(s)) with any personally identifying information from any source as part of our use of that service. We pledge to abide by this policy and will comply with all applicable laws relating to the collection of information from visitors to our websites. What's a cookie? According to Google's privacy FAQ, a "cookie" is a small file containing a string of characters that is sent to your computer when you visit a website. When you visit the website again, the cookie allows that site to recognize your browser. Cookies may store user preferences and other information. You can reset your browser to refuse all cookies or to indicate when a cookie is being sent. However, some website features or services may not function properly without cookies.